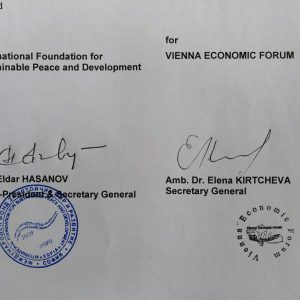 On 14 September 2018 a comprehensive meeting between the representatives of the leadership of the Vienna Economic Forum (VEF) and the International Foundation for Sustainable Peace and Development (IFSPD) was held in the premises of the central office of the Vienna Economic Forum based in Vienna (Austria) under the consent and errand of the leadership of the International Foundation for Sustainable Peace and Development (IFSPD). The meeting was led by the Secretary-General of VEF, Dr. Elena Kirtcheva, and Vice-President Mag. 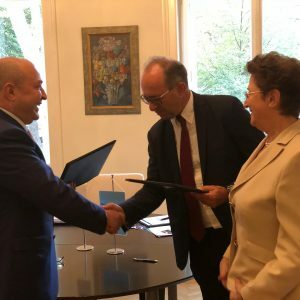 Hermann Anderl, Managing Director, Canon CEE GmbH, and the Secretary-General and Vice-President of IFSPD Prof. Dr. Eldar Hasanov, which ended with the official signing of the Memorandum of Understanding between these two organizations. With an opening speech, Dr. Elena Kirtcheva addressed the present ones, extending the warm and hearty greetings to the IFSPD delegation and expressed satisfaction and readiness to establish a reliable long-term partnership between the two organizations. After a brief outline of the organization’s history, the VEF leadership presented the structure and priority areas of VEF activity. 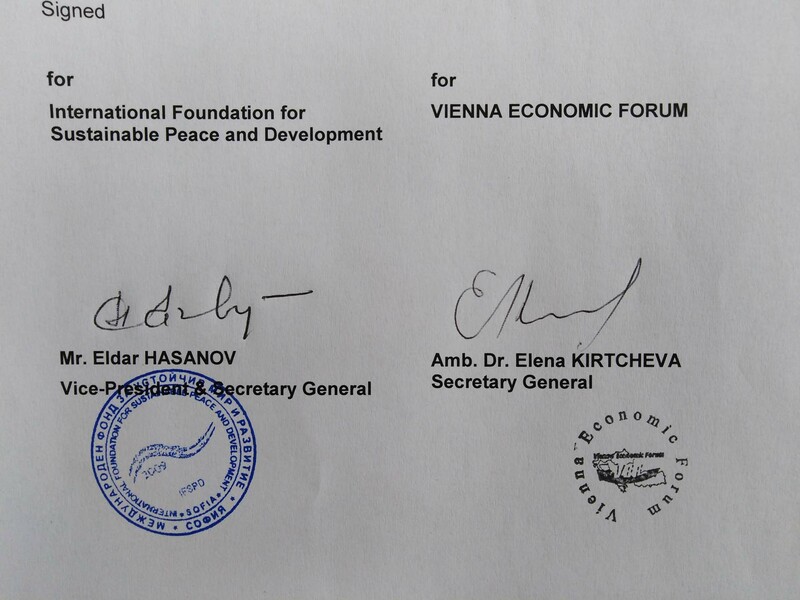 Also, the Secretary-General, Dr. Elena Kircheva, invited representatives of the IFSPD leadership led by the President and the Secretary-General to participate in the 15th Jubilee Vienna Economic Forum scheduled for 19 November this year. 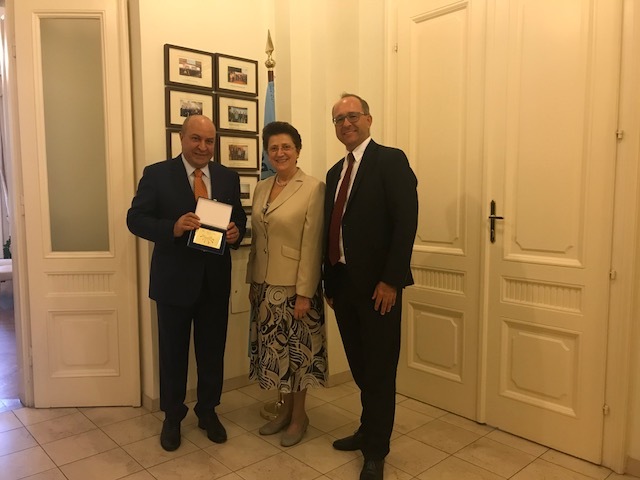 On behalf of the IFSPD leadreship and members, the Secretary-General and Vice-President Prof. Dr. Eldar Hasanov expressed gratitude for the warm welcome and congratulated the representatives of the VEF leadership and all the members on the successful and active work of their organization. Then, he briefly outlined the path passed by IFSPD, presented the organization’s prioritized activities, as well as achievements in research projects, which made the foundation an international think tank. The Secretary-General invited the VEF leadership to be honored guests at the celebration of the tenth anniversary of IFSPD, which will be held on 4 March 2019 in Istanbul (Turkey). 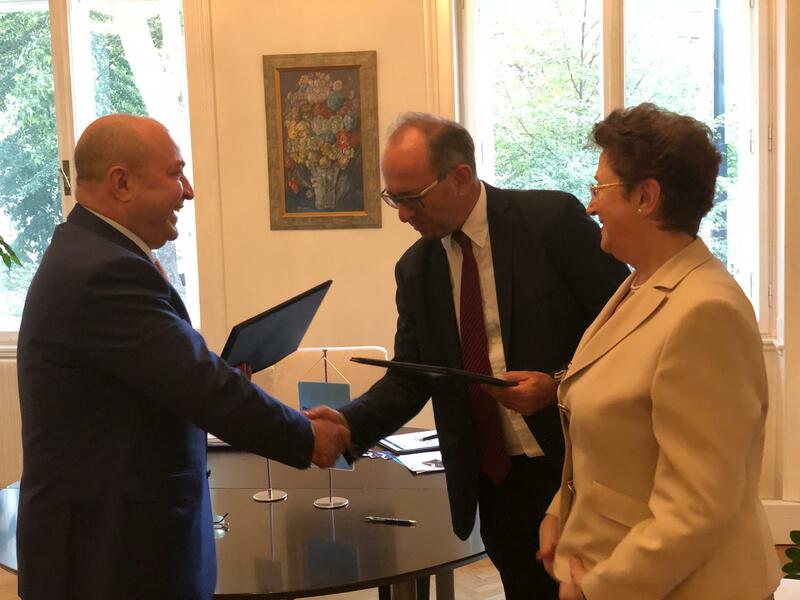 Then, representatives of the leadership of both organizations discussed in detail the opportunities and forms of joint cooperation, which are defined by the bilateral Memorandum of Understanding between IFSPD and VEF, with the official signing of which the meeting was completed. 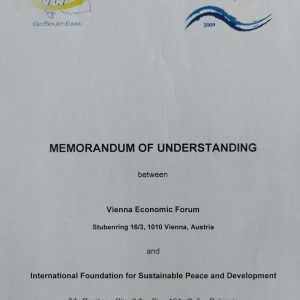 The Memorandum of Understanding is aimed at establishing a stable and long-term partnership between the two well-known organizations, as well as supporting the economic development and activities of members of both organizations, strengthening relations and ties in order to increase economic activity, for the benefit of both sides. 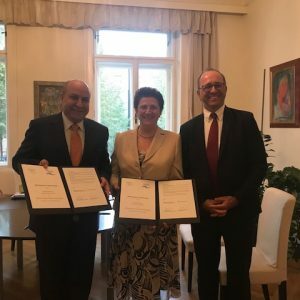 In accordance with the policy of the International Foundation for Sustainable Peace and Development of IFSPD, it was stressed that the coordination and implementation of this Memorandum in the field of economics will be delegated to the IFSPD branch in Istanbul (Turkey) – Vice President of the International Foundation for Sustainable Peace and Development, Dr. Ismail Safi. 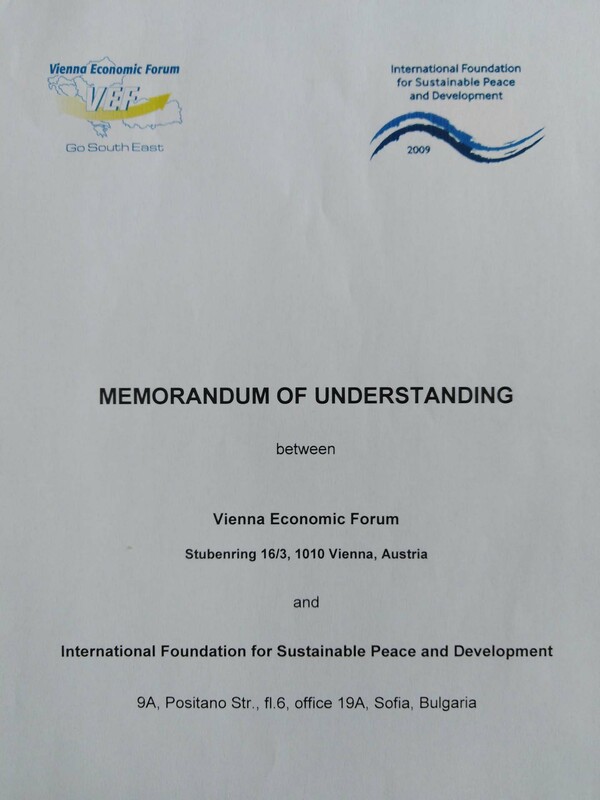 The Memorandum of Understanding has the same rights and obligations for both parties, which imply: mutual support of the initiatives of the two organizations in terms of their expansion, carrying out activities, expanding membership, the possibility of participating in activities carried out by the partner organization, regular exchange of economic information, investment opportunities and so on. 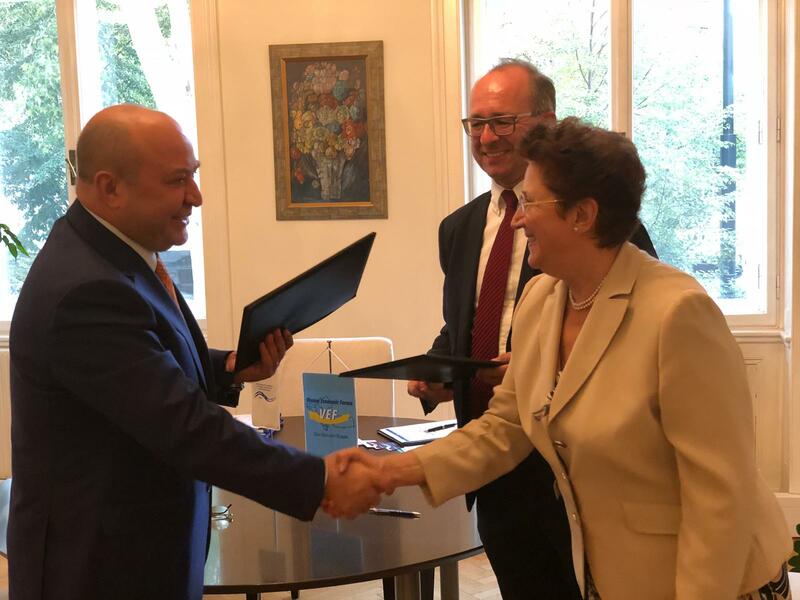 In this connection, the Secretary-General of the VEF, Dr. Elena Kirtcheva, proposed the joint holding of an economic summit in 2019 in Bucharest (Romania). The Secretary-General and the Vice-President of IFSPD Prof. Dr. Eldar Hasanov expressed his support for the joint conduct of this event. 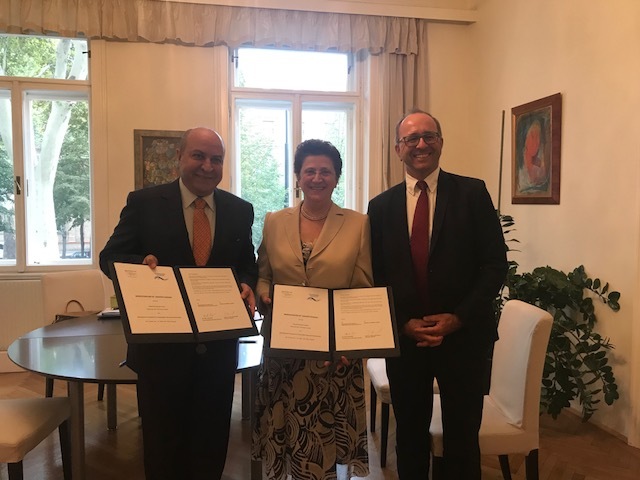 After the signing ceremony, the representatives once again expressed great satisfaction with the extremely meaningful meeting and confidence in the further fruitful and successful cooperation.